We believe that Because of the nature of the constitutional function of parliaments, they can close the implementation gap, the gap between a States’ commitments in international law and the reality on the internal ground of the States. While parliaments’ role has historically been neglected by the international human rights machinery, now the need to address the gap arising when states do not effectively implement the internationally agreed human rights standards to which they have committed themselves. Parliaments can both prevent violations of the rule of law and human rights and can act to prevent them from happening again. However, clearly, there is an important concern about democratic legitimacy. The fundamental question arises in relation to the states whose politicians claim their mandates from the people and regularly insist that they represent the views and interests of the people, though their parliaments do not reflect their people’s political opinion, pressures, and the diversity of their citizens. We would like to highlight the fundamental principles which have been declared by the Inter-Parliamentary Council’s members at its 154th session (Paris, 26 March 1994) ON CRITERIA FOR FREE AND FAIR ELECTIONS. We understand that the periodic free and fair elections are recognized by States in universal and regional human rights instruments, including the right of everyone to take part in the government of his or her country through freely chosen representatives, to vote in such elections by secret ballot, and also to have an equal opportunity to become a candidate for election. Everyone has the right to join, or together with others to establish, a political party or organization for the purpose of competing in an election. We believe that if these fundamental requirements for a democratic system are not satisfied, the states parliaments would not be able to represent their own people’s political views. We highlight the facts as to this issue that in what ways a state’s electoral system which does not satisfy basic international standards; can be considered a representation of its people specially the ethnic minorities? 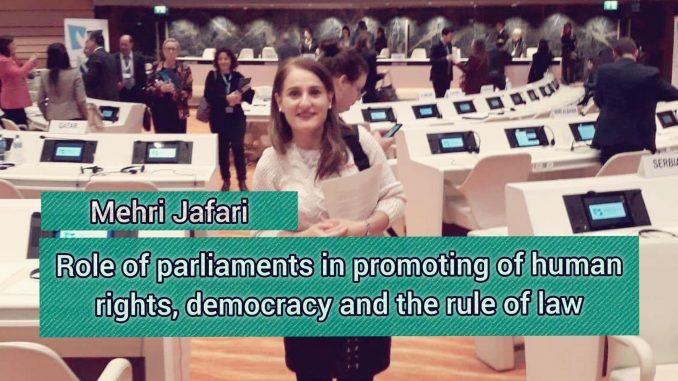 We would like to draw your attention to the systematic discrimination against the ethnic minorities in Islamic Republic of Iran, their basic rights including being represented by their own freely elected candidates and contribution in the process of the national election. Given the lack of access to freedom of expression and peaceful assembly and in some cases the dire situations of ethnic minorities in Iran, the Iranian ethnic minorities remain dramatically unrepresented in the countries like Iran. We would therefore encourage a debate around the role of stakeholders and the democratic countries’ inter parliamentary inspirations in moving the global agenda forward and considering what measures can be taken to further enhance the contribution of parliaments to the work of the human rights mechanisms, and to address the fact that the parliamentary elections should express the will of the electorate, and to do so, they must be ‘free and fair’. Consequently, the UN bodies can foster greater and more systematic engagement between parliaments and human rights mechanisms.